Every second grader knows how to pledge allegiance to the flag, but do you think they realize when they place their right hand over their hearts that they're expressing loyalty to what we call the "Red, White, and Blue"? We at the Gunnison Pioneer Museum know that is what it means. We give our allegiance to our Country and especially to our Veterans Memorial Flags that are on display in the Jordan (Military) Building. We would like to invite all of the Gunnison Citizens and all of our guests that are visiting in the Gunnison Valley to come down and to pay attribute to our Veterans that were willing to defend for our Country. This weekend we will all be out to celebrate America’s freedom and what better way would there be than coming to the museum and seeing these flags and touring the rest of the museum. Our first flag was donated by Steve Bathje in honor of Sergeant Robert M. Bathje, served active duty 1958-1960 and inactive duty from 1960-1964. Ben Cowan donated the flag of Dale Cowan, Dale enlisted December 6, 1943 and served thru May 20, 1946.He served on aboard the USS Hamul A20 (Destroyer Tender). Clifford Clawson flag is our next flag to display. The flag for Robert Cressman, Jr. was donated by Betty Cressman Robert served in the U. S. Army from June 1945-April 1947 as a Technician Fourth Class. He served in the army of Occupation, Naples, Italy. Robert Easterly donated his great uncle Bob Easterly. Bob Easterly was born 12/4/1886 and died 8/22/1964. John H. Elmer WW1 Veteran’s flag was donated by Don Dunbar. John was Alta Dunbar’s brother and the flag was presented to Alta in 1966 by the VFW and American Legion. Our next serviceman’s flag is Troy Fulton, this flag was presented to Bob and Alice Fulton at Troy’s military Funeral in Hays Kansas. Troy served in the U. S. Navy during WWII on the USS Hollandia. Troy was Bob’s father. 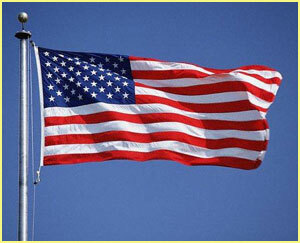 There are two American Flags that were flown over U. S. Troupes during Storm which began January 1992. A flag and Certificate Honoring Larry and Ruth Dolezal. This flag was flown on May 30, 2011 over the Gulf Region District Headquarters Camp Wolfe in the Province of Baghdad, Iraq during Operation New Dawn. There are two more flags with certificate on behalf of Edward Kenny, both flags were flown on “Forward Operating Base AI Teqaddum AI Anbar Province Iraq Operation Ira Free DOM 08.2. The Gunnison Pioneer Museum is very proud to have the flags of all these great Americans that were willing to put their lives in danger to defend America when the need was there. VETERANS AND OUR PRESENT TROOPS!!!!!!! 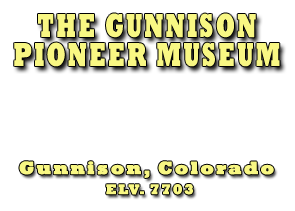 If you and your family are out and around and wondering what to do for the next few hours, stop by the Pioneer Museum and see all of our great displays of Gunnison County and the United States. Our wish is that all of the UNITED STATES OF AMERICA will have a great 4th of July celebrating the Independence of America.